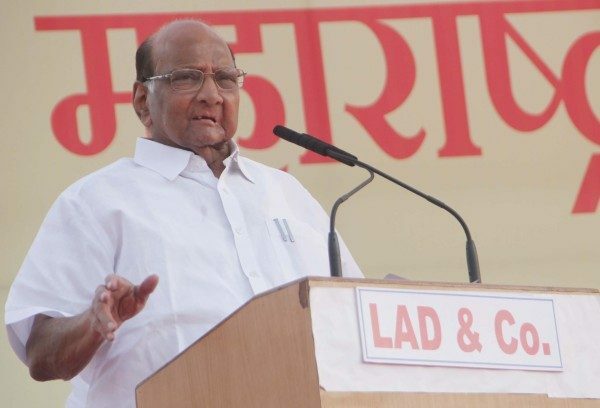 NCP president Sharad Pawar visited Belagavi after a gap of 32 years and took part in various functions including the MES convention held at CpEd ground on Saturday. Pawar said that the voters must be united and if there are more MES MLA’s that would strengthen the case of Belagavi’s merger with Maharashtra in the Supreme Court.Earlier at the airport he hinted towards the formation of the Third front which could drive nation to glory. He added he has not hatred for Kannada or Karnataka, infact Karnataka is like my brother. But we expect the same respect from the other side. Kishan Rao Yellurkar, Ram Apte and Krishna Menase were felicitated by Sharad Pawar for their contribution. It’s all about respecting local cultures and aspirations, which if a govt. Acknowledges and accepts, then you can address the resentment. Govt. of Karnataka behaves as if they are kings and insults local aspirations, and keeps the issue burning..There were separatist movements in Andhra Pradesh, Vidarbha..one can not subside people movements for long..Resolving it by discussion doesn’t take place..may be there can be alternative to separate state too. do not divide yourself vote only to single party . hindus should learn from muslims. Greediness destroys the souls of every human being, no matter how much one has gotten hold of earthly possession still wants more, never enough, which in turn creates fights amongst brothers/ neighbors /community etc. Would it not be sensible to be satisfied with what we have and thank God for that? Peace brings joy into every heart and hatred erodes inner core of every being. Let’s get along and live in peace and harmony as God intend us to be.